You know what would make a mug of coffee or hot cocoa even more delicious on a snowy cold winter day? 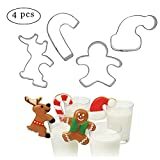 Having one of these cool new Gingerbread Man Cookie Mug Toppers hanging off the side. 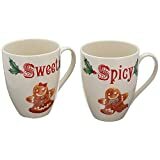 These festively fun gingerbread men are specially cut to hang off the edge of a coffee mug with one arm and wave at you with the other. They're made from a traditional gingerbread recipe and finished with faces, scarves, and other features made from icing. 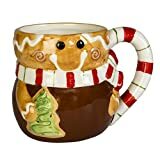 Perfect for accessorizing warm beverages during holiday gatherings or just whenever you want to take an adorable little gingerbread man, dunk him in coffee, and then bite off his head. Yum!